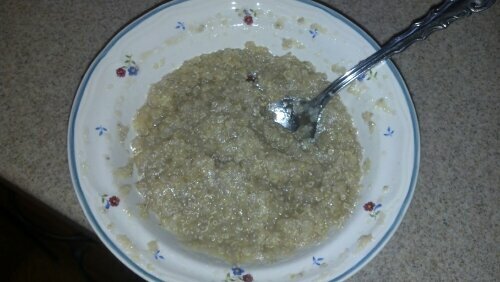 1/4 cup prepared quinoa, 1 (3.9 oz) container Motts all natural applesauce, 1 TBS chia seeds (of course! ), 2 tsp coconut oil, few sprinkles brown sugar to taste. Combine all ingredients in bowl and microwave for about 1:30. Easy peasy , I made up a batch of quinoa Sunday night and will be eating this all week! Went to work….blah. Boring,I’ll spare you the details of being the office jack of all trades phone nurse. But I did enjoy a nice tuna sandwich and a kiwi for lunch! Came home just in time to eat some dinner with the hubby before he headed off to work midnights. Took a short nap…yep, nap….then hit the treadmill for a not so quick 2.5 miles. 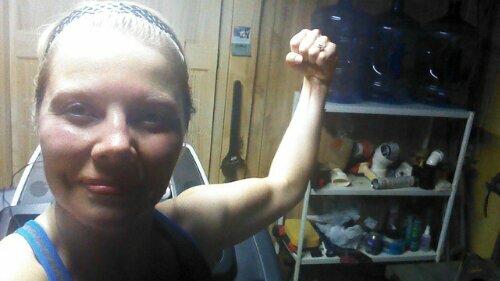 Sweaty me rocks! And smells great,too. Ordered my first Bulubox yesterday, not set to ship until May 15, but excited to try it none the less! Bulubox…give me the deets people! so, do you name your guns like your son does? surely you remember “thunder” and “bruce?” 🙂 very proud of you, my sister!!!!!! by the way, what is bulubox? They need to get bigger before they get names! Bulu box is a monthly box full of vitamins, healthy junk, fitness gear, etc. Can’t wait to get my first one!